Rumor had it that J Alexanders on Sand Lake Road was about to go out of business. This is no longer a rumor. J. Alexanders has closed for business. There is a lot of competition on Restaurant Row and they all can’t make it, rent is not cheap in those parts. Sand Lake Road is our Beverly Hills of restaurants. Speaking of Restaurant Row Eddie V’s is being built and erected where Timpanos was. The Darden Corporation leveled the old Timpanos and started from scratch on Eddie V’s. Can’t wait to see this place, millions is being invested in this semi high-end restaurant. If anyone can start a buzz Darden can! In the Dr Phillips Marketplace area we have some new restaurant openings coming soon. Keke’s Breakfast Cafe is coming soon! They will occupy the space formerly known as Five Guys. Next door to Keke’s is Stefano’s Grille which has been trying to open for a while now. Their actual sign is up, and that is a start! Press 101 closed awhile back. A restaurant owner in the Dr Phillips Marketplace told me someone was looking to open up a restaurant where Press 101 once was and negotiations are underway. Alot of restaurant openings and closing going in 2013 and more to follow. Reminder!!!! —–Please follow The unofficialrestaurantreview.com on the Foodspotting app. I have tons of food photos from many different restaurants. Located a hop and skip away from Universal Studios Florida is Border Grill. This place is very hidden. It is off of Kirkman Rd and Vineland in a small strip plaza. This place has some of the most amazing authentic “Street Tacos” I have found in all of Orlando. I really thought I was having lunch in Mexico. It’s my type of place. Very small, very rustic, very much a hole in the wall, very inexpensive and it is family owned and operated. The main attraction is their Tacos. They also serve up Burritos and Sopes and other Mexican flavors as well. I tried the Carnitas taco, the pollo asado grilled chicken, the steak tacos, and the marinated grilled pork taco which was a suggestion from one of the owner’s. Each taco I had was wonderful. The tacos appear to be very basic but they are filled with flavor and spices. 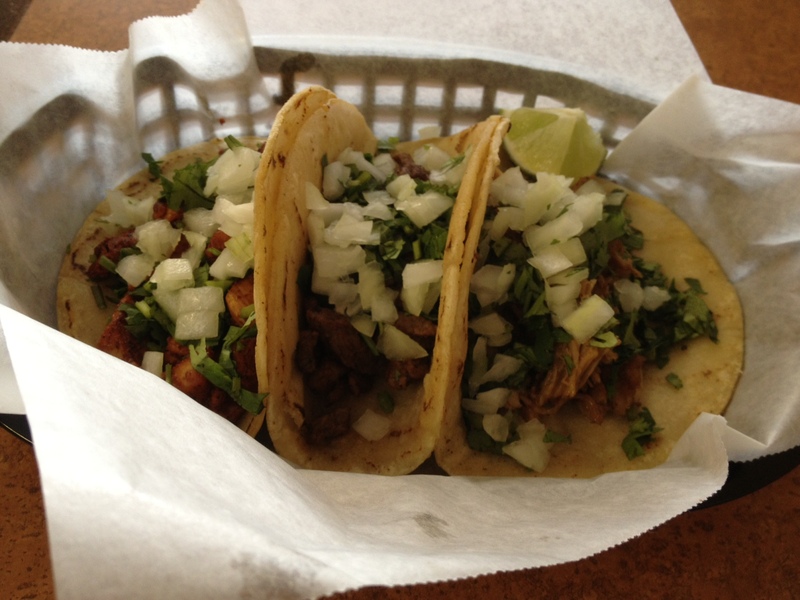 Street tacos are normally served with corn tortillas and with cilantro and diced onions. That’s it. Then you add your favorite sauce to it. Border Grill had a variety of sauces to choose from. I enjoyed every taco I had. Every taco was seasoned properly and the cilantro and onions married into the meats was a match made in taco heaven. Oh, how about the price of each taco, each taco was a whooping $1.85 cents, that was the price listed on their chalkboard menu. The place is very small. You order form the counter. They bring you the food to your table. They only have 5-6 tables, mainly high tops. You don’t come here for the atmosphere, you come to Border Grill for their amazing Tacos. Plenty of parking is available. 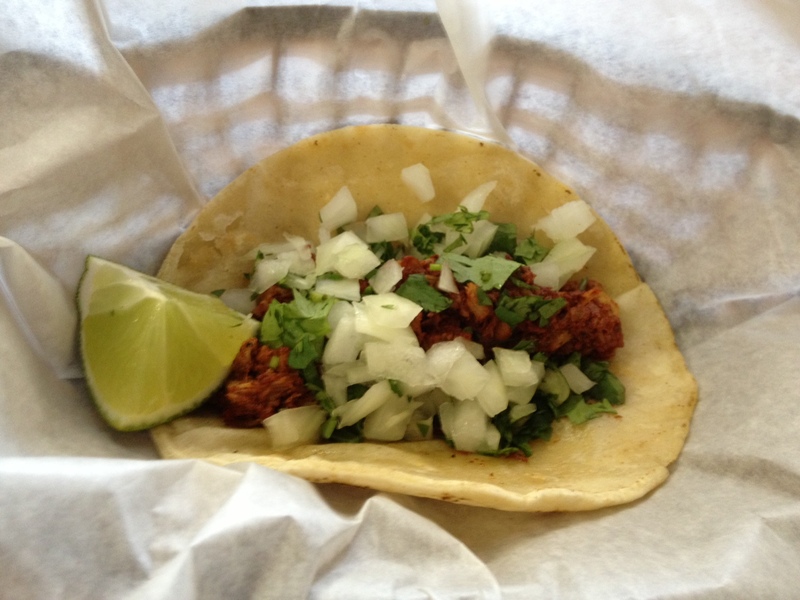 As I write this review, I noticed Border Grill’s rating on Urban Spoon from a voter standpoint. It had 125 votes and 99% liked it! That is a very strong number. That is very meaningful. Rarely do you see stats like 99% “likes” on Urban Spoon. I give their tacos and service 2 thumbs up! Don’t walk but run over to Border Grill. 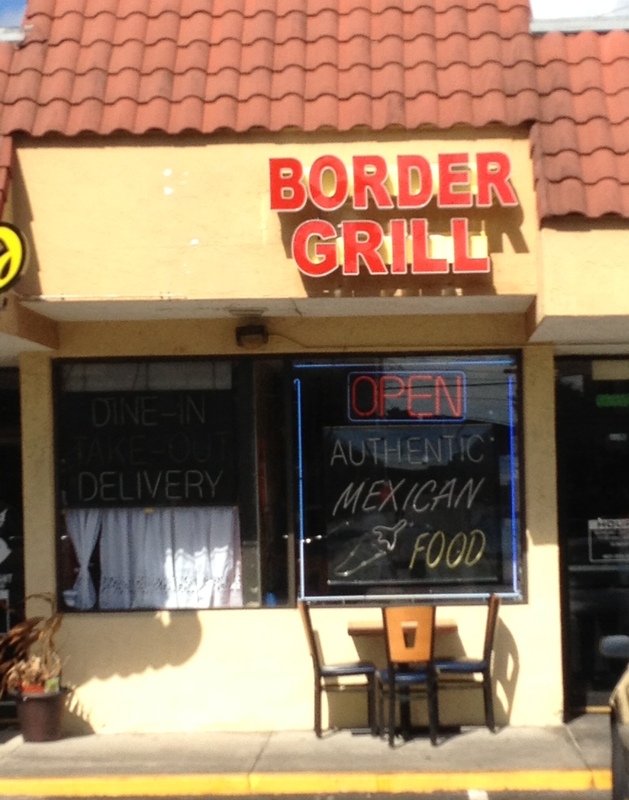 Border Grill is located at 5695 Vineland Rd, Orlando, Fl ph # 407-352-0101. Wow, what a year in the Central Florida restaurant community. We said HELLO and GOODBYES to a lot of restaurants in our fine city in 2012. To many to track to be honest, so I will hit the highlights. Let’s start with the BBQ community. Well 4 Rivers kept expanding and added locations around Central Florida. Red Eye BBQ Grill (former food truck) opened up in Ocoee in the former location held by Matthews Steaks which closed. Speaking of closings, the landmark bbq joint O’ Boys closed, Blackwater Bar-b-q closed, Bubbaques at University/Dean also closed. Which good BBQ restaurant is coming to a theatre near us in 2013 that will compete with 4 Rivers and Bubbalou’s? Did we have enough Burger Restaurants with BurgerFi, Burger 21, Boardwalk Fresh Burgers & Fries, Five Guys, etc? I guess not. So we welcomed Red Robin in Winter Garden and the former original 4 Rivers became B&B Junction. Frankly speaking, I can’t keep up with the Burger Factories in our area. I am going to weekly therapy for this and will improve here, I promise. Restaurant Row said Hello to Rocco’s Tacos a very fun high energy taco joint. Raga an Indian restaurant just opened, Miller’s Field a new Sports bar has opened, and Peperoncino a very authentic Italian restaurant opened up. The Row also said Goodbye to City Fire and Five Guys in Dr Phillips. Speaking of Dr Phillips it is my understanding Stefano’s Grill will be opening soon in the Dr Phillips Market Place (same owners of Stefano’s in Windermere which closed). Lots of Hellos on IDRIVE in 2012. The tourist district welcomed Big Italy, Marlows Tavern, Senor Frog’s, The Pub, Fogo de Chao just to name a few. I also noticed in 2012 some nice expansions from current restaurant owners. The owners of the popular and well-known Ravenous Pig opened up Cask & Larder in Winter Park. Teak Neighborhood Grill in Metro West known for their outstanding burgers opened up Rus Teak Restaurant & Wine Bar in Ocoee which seems to be a hit with the locals and it is much more upscale than its sister location in Metro West. Some well known steak houses decided it was time for a new name. Del Frisco’s has or will become Christner’s Prime Steak & Lobster, and Houston’s has become Hillstone. Sounds like a plan to me. In the Italian restaurant community Orlando lost a landmark Cafe Italiano one of Orlando’s oldest Italian restaurants on 436 near the airport closed in 2012. Maitland said hello to Francesco’s Ristorante Pizzeria, been there several times and have enjoyed everything I have ordered to date. Mccormick & Schmick’s said bye bye at Millenia Mall and now ready to erect in the same location is Capital Grille. This means we will now have 2 Capital Grille locations. Again this is just a high level look at 2012 restaurant news in Central Florida. I look forward to what 2013 brings us in our restaurant community. Happy New Year! See you in 2013 Central Florida Diners! I have been out on the search for the best Buffalo wings in town for quite sometime. I tried the wings from all the usual suspects or most of the usual suspects in town. I went to Hooters, Wing House, Buffalo Wild Wings, Ale House, Millers Field, tried the smoked wings at 4 Rivers, Flyers, Bloodhound Brew and just too many other bars and restaurants to list. Why? Simply because I wanted to find the best Wings in town. After trying place after place sports bar after sports bar dives diners and drives after dives diners and drives I kept coming back to one place for the Wings. I am talking about Josie’s Pizza and Wings. Josie’s Pizza & Wings is located on South Hiawassee Rd in the Metro West area. These wings $8.99 (10) was succulent, crispy and are fried to perfection and are made to order every time. Just like the 1964 buffalo style recipe Josie’s Wings are not breaded. Their rich buffalo sauce is made fresh on the premises daily. This recipe and their wings at Josie’s are the closest thing to the actual Anchor Bar in Buffalo, NY. These wings are that good in my humble opinion. I also equally loved their Butter Garlic wings. They were fried to the requested well done, extra crispy. You could taste the butter and garlic flavors with every bite. The wings are simply very good! The service was attentive and friendly on all visits, the staff members seemed genuinely happy to be there. All the HDTVs are centrally located, great viewing in all areas of the restaurant. Great place to watch your favorite game. They have a regular bar area when you first walk in on the left. They have plenty of high tops and regular table seating. They only serve beer and wine only. Parking was fine no issues. Priced right always a plus. This sports bar is not your average sports bar located in Metro West. Josie’s Pizza & Wings has been around for 20 yrs. There are reasons for this. They make a good quality pizza pie and they make the “Best” wings in town. Forget about it!! Why go to the Anchor Bar in Buffalo, NY when we have Josie’s! Josie’s is located at 1225 South Hiawassee Rd, Orlando, Fl 32835. They are open Mon-Thur 11am-11pm. Friday 11am-12am. Sunday 11am-11pm.